Since 2005, SafeLives has worked with organisations across the UK to transform the response to domestic abuse, with over 60,000 victims at high risk of murder or serious harm now receiving co-ordinated support annually. Together, we’ve achieved a lot. However, the response to domestic abuse is still uneven, despite huge efforts by many people. It remains piecemeal, underfunded, does not help all victims and their children effectively, and does not do enough to challenge the behaviour of perpetrators. 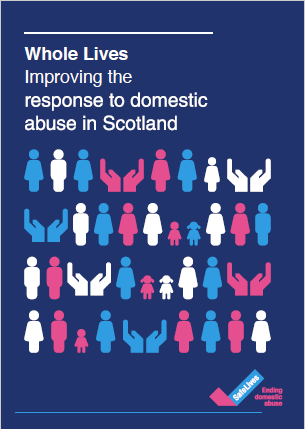 This report looks at the current need and provision with regards to domestic abuse in Scotland, drawing on SafeLives’ own relevant datasets, including service level data (Insights) and multiagency level (Marac) data. This report builds on the knowledge and expertise of those who have worked or do work in frontline support roles, to get their practical perspective on service delivery. Finally, and vitally, it amplifies the voices of those who know best – victims and survivors with lived experience of domestic abuse. Looking at the current situation and the context, we suggest practical ways of moving the response forward. We definitely don’t have all the answers, and there is much more to do to gather the required evidence to give us the full picture. However, this report provides us with the opportunity to understand what we know, what we don’t, and what might need to happen next. Training in how to give domestic abuse victims all the support they need. For Idaas and professionals in Scotland. Register your interest for Autumn 2017. Accredited training course for service managers in Scotland. Developed by experts in the field including Violence Against Women Coordinator Andrea Beavon.